If you’ve been following along, you should have a neat and tidy pantry and your refrigerator and freezer should be spick-and-span. Along with your orderly kitchen, you should also have an inventory of the food that you have on hand. Taking an inventory was part of the Day 2 & Day 3 assignments. 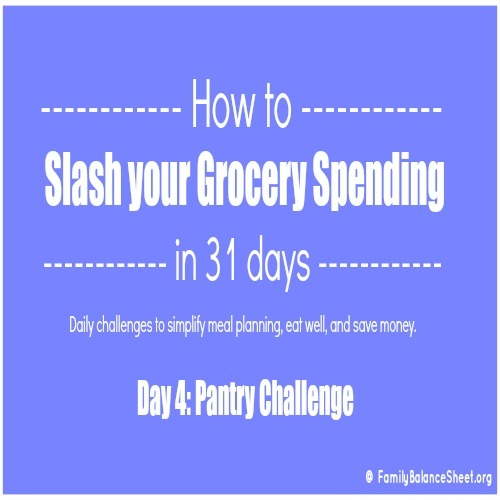 Today, we’re going to plan meals using those inventories of foods you found in your pantry, fridge, and freezer. This week’s meal plan should already be complete–that was Day 1’s assignment–so we will use these meal ideas on Day 8 when we plan next week’s menu and grocery list. If you’re stumped with what to do with some random or odd ingredients, search the ingredient on Pinterest. I do this all the time and have found many new tasty recipes. By doing the work today, Day 8’s assignment will be a little easier. And hopefully, your next shopping trip won’t be as expensive, because you’re using food already in your kitchen. I am also participating in this 31 Day challenge. Personally, cleaning out my freezer was the most enlightening. I found lots of frozen fruit that we will use for smoothies. I also found a big bag of frozen grape tomatoes and pasta that I will use to make Pasta with Clams and Fresh Tomatoes. I will need to buy the canned clams. I found a big bag of chicken wings that I bought in January during the Super Bowl sales. I’ll plan a fun family night in and make our favorite Garlic Parmesan Chicken Wings. I also found a small container of leftover Chicken & Black Bean Taco Meat. I’ll use it to make nachos the same night I make the wings. And sadly, I found a lot of bread and rolls. 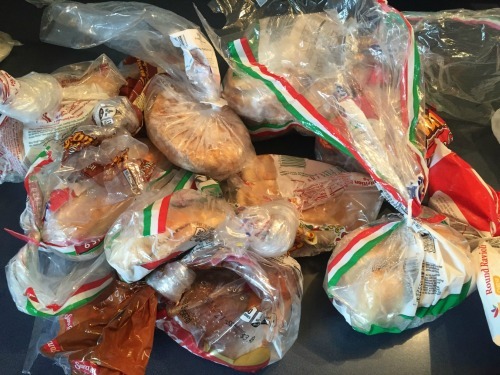 I freeze bread when I think we won’t eat it in time and I found a ton of bags with just a few pieces of bread in the bag. These bags were shoved to the back of the freezer and forgotten about. The dates on many of them were from last summer and fall. I tossed the bread. I know homemade bread crumbs was an option, but I’m not a big fan. I need to become more mindful of finishing a bag, before opening a new one.